Our first surprise came as we arrived at NorthSouth to find that it wasn't going to be open until 9am - fair enough, there were things to do to pass the time. The second less pleasant surprise came when we were told that those famous 60° eggs wouldn't be available until later - probably after 10am. To be honest the menu isn't very large and to have your main attraction unavailable isn't a good thing. Eventually we did manage to selection something. 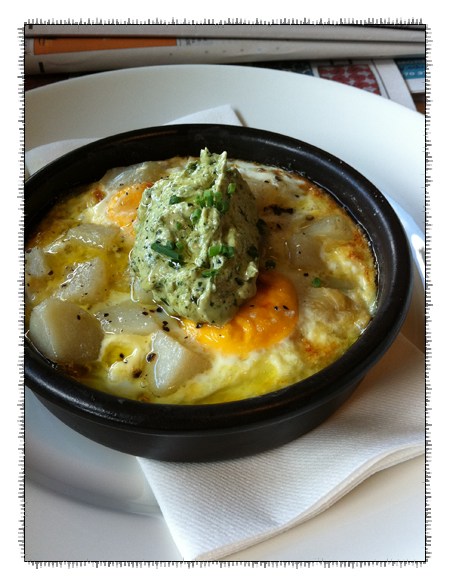 This was described as oven baked potatoes with eggs with some type of minted tahini sauce. Unfortunately the eggs were way overcooked and the rest of the dish incredibly bland, except for one mouthful of ground pepper. The only factor that made this edible was Paalo's excellent bacon that came with his dish of scrambled eggs and bacon - the bacon providing much needed flavour that this offering was missing. A dish I'd put in the need to work on pile.